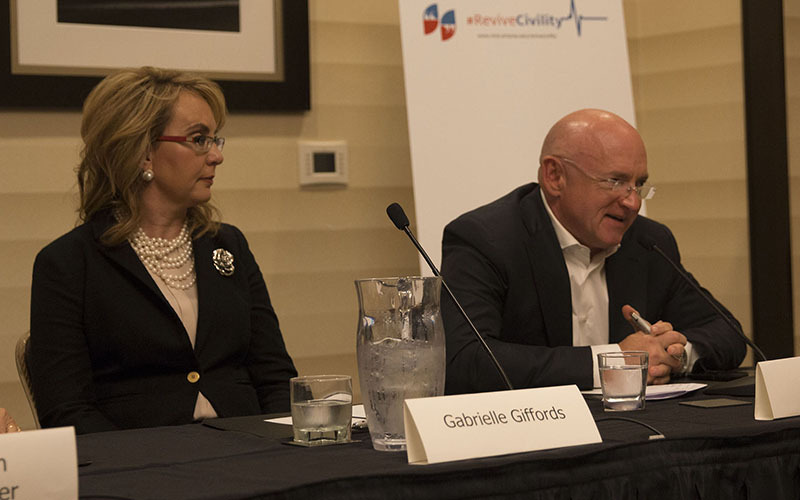 Giffords and Kelly were on hand to help the University of Arizona’s National Institute for Civil Discourse launch its “Revive Civility” campaign, which aims to bring more respectful behavior to the 2016 campaign. “In modern political history, we’ve never seen anything like we’re seeing this year,” said Carolyn Lukensmeyer, executive director of the institute. The 2016 campaign has seen widely reported taunts between presidential candidates in the primaries, name-calling, racial epithets and outbreaks of violence between supporters and opponents at some campaign rallies. He and Giffords joined former Oklahoma Republican Rep. Mickey Edwards and Ohio state Rep. Stephanie Howse, who are members of the advisory board to the institute. 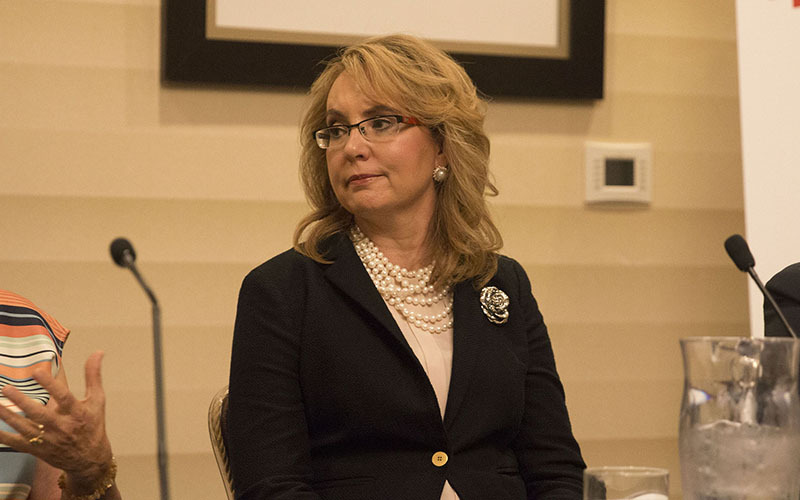 It was formed in the wake of the 2011 Tucson shooting that killed six people and wounded 13 others, including Giffords, who was the target of the attack. The assassination attempt forced Giffords, a Tucson Democrat, to resign her seat in Congress in 2012 so she could focus on her recovery. 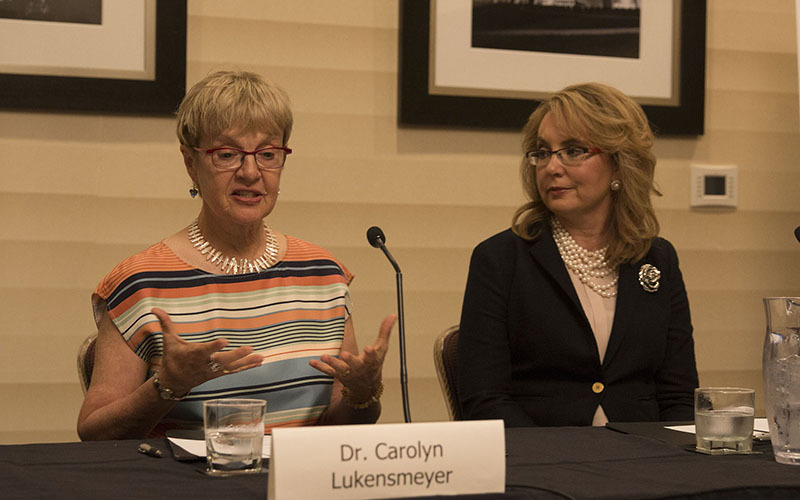 In sporadic visits to Washington since then, Giffords appears to have made steady progress. She did not speak at Thursday’s event, but walked unaided – if haltingly – to her seat on the panel and nodded in agreement to statements by the other panelists, interjecting a word or two on occasion. Kelly, who spoke on Giffords’ behalf, said they were both dismayed by the current tenor of the national debate. He said it’s particularly important for both those in office and those running for office to behave respectfully. He added that candidates should be held accountable at the polls by voters. Edwards said the institute’s focus has expanded from making sure there is civility between political leaders, to urging a standard of civility for the public as well. Lukensmeyer said there is nothing wrong with opposing viewpoints and protests, both of which are deeply rooted in American tradition. But disagreeing with someone doesn’t mean being disagreeable – or event violent. The Revive Civility campaign includes standards of behavior, social media tools to encourage respectable behavior, a “citizen toolkit” and the “civility seal of approval” to highlight particularly good discourse, according to the institute’s website. Lukensmeyer said the current state of affairs developed over years and she knows it will take a long time to reverse the trends. Despite the size of the task, she said, the goal is not that complicated. “They’re the things our mothers taught us before we went to school,” Lukensmeyer said.